Today the cannabis industry is booming and analysts have projected that it will grow from $9.2 billion in 2017 to $47.3 billion in 2027 in North America alone. This past year saw the first U.S. Food and Drug Administration-approved drug comprised of an active ingredient derived from cannabis. It also saw the first patent infringement suit involving a cannabis-related patent. And in just the first month of 2019 we have seen the first decision in a post-grant proceeding involving a cannabis-related patent as well as legislation for legalizing and regulating cannabis introduced in the House of Representatives. The arms race for cannabis patents has already begun and is likely to intensify as markets and the regulatory landscape mature. In this article we discuss some trends in cannabis patenting in the United States and evaluate how the U.S. Patent and Trademark Office is treating this class of applications in Technology Center 1600. We then compare prosecution trends in the cannabis space to those observed in the biopharmaceutical space generally. 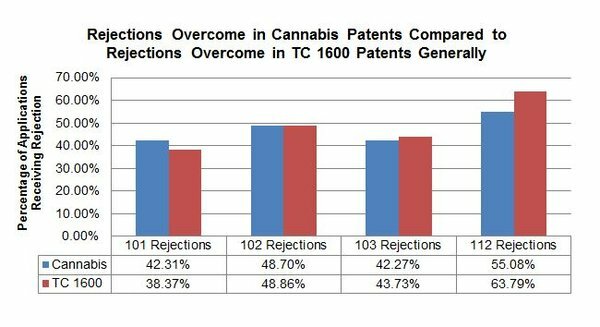 In brief, the patent landscape for cannabis is conforming roughly to that of traditional biopharma in terms of the rejections being raised and how they are being overcome. We conclude with some practical takeaways about what cannabis applicants can learn from biopharma prosecution strategy and vice versa. Patent application filings in the cannabis space from 1998 to the present have generally trended upward, subject to some downward cycles beginning in 2008 when filing numbers have fallen to less than 60 applications per year (Figure 1). These filing trends are generally reflected in the number of patents issued over time (Figure 2); namely, filing peaks are followed by issuance peaks that trail by approximately three years, presumably indicating the length of prosecution. The period from 2015 to 2017 saw the greatest increases in cannabis application filings, shooting upward to an all-time filing high of 118 applications filed in 2017. This was followed, however, by a sharp drop to just 72 in 2018. The ups and downs may be explained in part by the limited number of regular filers. Namely, aside from GW Pharmaceuticals PLC — a U.K.-based specialty pharmaceutical company focused on therapeutic cannabinoids who is recognized for being the first manufacturer to obtain FDA approval of a cannabis pharmaceutical product — the cannabis patenting space appears to have few major players. A survey of available assignment data indicates that the space is characterized by a long tail of one-off filings by medium to small commercial enterprises, some recognizable biopharma companies, and academic institutions. Interestingly, several cannabis-related patents have been licensed to the National Institutes of Health and at least one is assigned to the U.S. Department of Health and Human Services. Cannabinoids refer to a class of chemical compounds that act on cannabinoid receptors. Cannabinoids that originate in plants, including cannabis, are called phytocannabinoids and include cannabidiol and tetrahydrocannabinol. Given the biological origins and chemical properties of this class of compounds, cannabis-related applications are examined primarily in Technology Center 1600 at the U.S. Patent and Trademark Office. TC 1600 focuses on applications relating to biotechnology and organic chemistry. A survey of cannabis-related applications examined by TC 1600 reveals that a majority are focused on: cannabinoid receptor targeting; cannabis pharmaceutical compositions and derivatives; methods of treating disease using cannabinoids; methods of production and other processes (including extracting, purifying, concentrating, etc. ); dosage forms; detection methods; beverage products; and plants. Applications directed to receptor targeting, pharmaceutical compositions, and methods of treatment are, for the most part, being claimed in the same manner as one would expect to see in a traditional biopharma application, except that the active ingredient is a cannabinoid, such as CBD or THC. One notable difference, however, is the relative infrequency with which applicants appear to be disclosing associated clinical, or even pharmacokinetic, data for the claimed drug or dosage form. This may be attributable to the limited number of clinical studies conducted to date on cannabinoid therapies, due in turn to the challenges associated with obtaining the necessary permission to conduct them, at least in the United States. In lieu of such data, many applicants are citing individual case studies, animal studies, cellular studies, or biomedical literature. Another aspect in which the cannabis-related applications diverge from the traditional biopharma model is in the claiming and description of methods of production, processing, and delivery. This can be explained in part by the fact that cannabinoids are commonly derived from plants, in which they occur naturally and from which phytocannabinoids are extracted. Such extracts are typically then purified or isolated and included in some dosage form (e.g., tablet, lozenge, edible) or delivered by some other means (e.g., oil for transdermal delivery, vapor for inhalation, liquid for imbibing). How such methods are described, and at what level of detail, varies widely among applications. Some of this variation may be accounted for by the relative nascence of the field, the lack of standardization, and the diversity of approaches being taken. Like other inventions in the biopharma space, cannabis applications are, for the most part, facing similar rejections. For purposes of this analysis, we focus on rejections based on: subject matter ineligibility under 35 U.S.C. § 101; lack of novelty under 35 U.S.C. § 102; obviousness under 35 U.S.C. § 103; and lack of written description or enablement under 35 U.S.C. § 112(a). This analysis is based on 740 cannabis-related cases that received at least one rejection during prosecution, and the same for a representative sample of 4,000 cases examined in TC 1600. The current data set for cannabis-related applications is relatively small and the analysis may change as more cannabis applications are examined. We discuss some trends based on the available data. 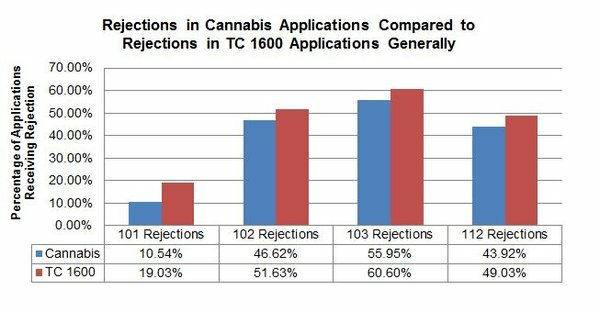 As shown in Figure 3, cannabis applicants are facing these rejections in roughly the same percentage of cases as biopharma applicants generally. With the exception of § 101 rejections, which are received in a notably higher percentage of biopharma applications, rejections under §§ 102, 103, and 112(a) are common and raised by examiners in close to half of all applications. In terms of success in overcoming these rejections, the two classes of applications are performing generally the same, with a couple notable differences. As shown in Figure 4 below, a higher percentage of biopharma applicants are proving successful in overcoming rejections under § 112(a) than their cannabis counterparts. On the other hand, a slightly higher percentage of cannabis applicants are proving successful in overcoming § 101 rejections than the overall field. While claim amendments appear to be the primary way that cannabis applicants are overcoming rejections, there are some notable examples of applicants succeeding on arguments alone. For example, one applicant overcame a § 112(a) rejection by submitting a declaration under 37 C.F.R. § 1.132 establishing that the claimed process for preparing the compound need not be described because it was known to skilled artisans. The same applicant also overcame a § 103(a) rejection by arguing no motivation to modify the prior art compound to arrive at the claimed compound. Another applicant overcame a § 112(a) rejection by arguing that, before the effective filing date, several studies had characterized the cannabinoid receptor activity at issue and described treatments for inflammation mediated by such receptors. Another applicant overcame a § 103(a) rejection by arguing that a skilled artisan would not have substituted the prior art fentanyl compound cited by the examiner for a cannabinoid, given the differences in their pharmacokinetic properties. On the § 101 front, an applicant successfully argued that the claimed conversion process involved heating the cannabinoid to remove carboxylic acid groups, thereby changing the naturally occurring cannabis into a different, non-naturally occurring product. The applicant also cited the fractional distillation process used to concentrate and extract the cannabinoid, as well as the processes for suspension in a pasteurized mixture and emulsification as patent-eligible modifications to the naturally occurring cannabis product. Given the significant overlap between the types of rejections faced by cannabis applicants and biopharma applicants alike, many of the principles and strategies that have proven successful in traditional biopharma prosecution should serve as logical guideposts for cannabis applicants. Second, biopharma applicants have proven relatively successful over the years in arguing secondary considerations to overcome obviousness rejections and survive post-grant challenges. Biotechnology is regarded as a relatively unpredictable field, one in which it is not uncommon to find unexpected results. Furthermore, in the case of a blockbuster drug, evidence of commercial success, long-felt need, and failure of others can be compelling where it has nexus to the claims. Given the similarities in subject matter, comparable technical achievements, and clear potential for commercial success, cannabis applicants are likely to have similar evidence available. Third, the conventional wisdom in recent years has been — and some empirical analysis has even shown — that TC 1600 issues more rejections based on lack of written description or enablement than other technology centers. This may be a function of how the law has developed, particularly with respect to claiming a genus defined by certain attributes — which is a common way to claim biopharmaceutical inventions so as to cover variations in competing products. In response to the increased rigor in § 112(a) rejections and post-grant challenges alike, biopharma applicants tend to approach specification drafting with an eye towards: describing present as well as after-arising embodiments; describing more than a subgenus, or at least describing sufficient species to be representative of the genus; and including a “principle of the claimed invention.” It is reasonable to expect cannabis applications to be subject to the same rigor. Thus, applicants should consider adopting an equally conservative approach to describing their inventions. Fourth, in the biopharma space many products and their corresponding claims involve a naturally occurring product or variant thereof. Cannabis is no exception. Drafting claims so that they are not “directed to” a patent-ineligible natural phenomenon is the preferred approach, in that it avoids a further inquiry into whether the claims recite “significantly more” than what was well-known, routine, and conventional. One way to achieve this objective is by ensuring that the composition recited in the claim is “markedly different” from the naturally occurring counterpart. In cases where the composition used is a natural product, method or process claims employing the natural composition in a non-natural or specific way may also avoid the issue. 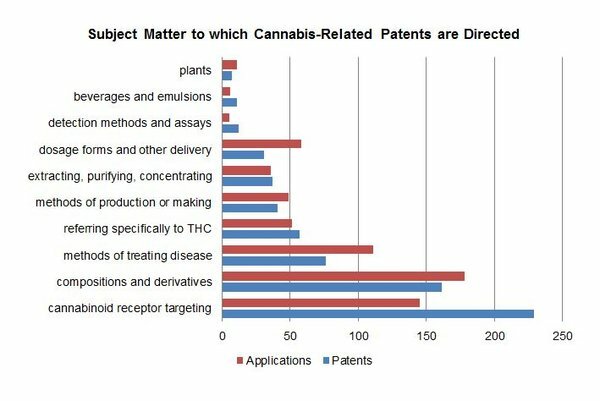 In sum, while the cannabis patent landscape is still maturing, current trends suggest that in the therapeutic space it is closely tracking that of biopharma. With the first cannabis patent infringement suit underway, we expect to gain more insight into how these issues play out in district court. Of note, the defendant in United Cannabis Corp. v. Pure Hemp Collective has alleged that the asserted claims are invalid under § 101 as directed to patent-ineligible natural phenomena, namely, cannabinoids and terpenes found naturally in the cannabis plant. This and other developments should shed light on patent enforcement dynamics in this emerging industry. Pauline Pelletier is a director at Sterne Kessler Goldstein & Fox PLLC. Deborah Sterling, Ph.D. is a director at the firm and co-chairs the biotechnology/chemical group. 21 C.F.R. § 1301.18 (requiring researchers conducting cannabis-based clinical trials under an FDA Investigational New Drug Application to have a DEA research registration). Figure 3 provides the percentage of cases in each category where the rejection was made. The dataset included 740 cannabis-related cases and 4,000 cases examined in TC 1600. Figure 4 provides the percentage of cases in each category shown in Figure 3 where the rejection was made and subsequently overcome, as indicated by issuance of a patent. U.S. Application No. 12/740,099, Notice of Allowance (Feb. 19, 2013). U.S. Application No. 13/236,317, Applicant Arguments (July 16, 2012). U.S. Application No. 14/561,091, Applicant Arguments (March 18, 2016). U.S. Application No. 14/677,614, Applicant Arguments (Sept. 25, 2017). Eli Lilly & Co. v. Teva Parenteral Medicines, Inc. , 845 F.3d 1357, 1364 (Fed. Cir. 2017). See, e.g., AbbVie Deutschland GmbH & Co., KG v. Janssen Biotech, Inc. , 759 F.3d 1285, 1298-302 (Fed. Cir. 2014). U.S. Steel Corp. v. Phillips Petroleum Co. , 865 F.2d 1247, 1253 (Fed. Cir. 1989). Mayo Collaborative Servs. v. Prometheus Labs., Inc. , 566 U.S. 66, 73 (2012). Diamond v. Chakrabarty , 447 U.S. 303, 310 (1980); M.P.E.P. § 2106.04(c). Vanda Pharm. Inc. v. WestWard Pharm. Int’l Ltd. , 887 F.3d 1117, 1136 (Fed. Cir. 2018) (holding that claims “directed to a specific method of treatment for specific patients using a specific compound at specific doses to achieve a specific outcome” were eligible and not directed to the natural phenomenon); Rapid Litig. Mgmt. Ltd. v. CellzDirect, Inc. , 827 F.3d 1042, 1047 (Fed. Cir. 2016) (holding that claims directed to a “method of producing a desired preparation of multi-cryopreserved hepatocytes” are patent eligible, even if the process uses a product of nature and even if the transformation is governed by the laws of nature). United Cannabis Corporation v. Pure Hemp Collective Inc., 1:18-cv-01922, ECF No. 32 (D. Col. Nov. 29, 2018) (motion for partial summary judgment) (motion pending). All Content © 2003-2019, Portfolio Media, Inc.